Due to it’s ease of growth and large harvests, Wappa feminised cannabis seed strain by Paradise Seeds, is one of the most popular varieties in its catelogue. Wappa feminised is an indica strain renowned for it’s stability and it’s ability to thrive and keep on producing. Paradise Seeds, Wappa Femininsed, has an intense but not overwhelming effect that provides a happy active cerebral high which is also popular with medical users. Big Bud Secret… Welcome to Wappa, an award winner and one of our most popular strains thanks to ease of growth and chunky harvests. The heritage of this plant is a sweet skunk and we bred this line, selecting the biggest and the juiciest plants of each generation to build the Wappa profile. What makes this plant such great value for money is its special power to thrive and keep on producing. A perfect plant for the beginner and also popular with pros who are looking for big yields and a dependable product. The plant itself is stout and sturdy, an indica strain that is renowned for its stability. The high calyx-to-leaf ratio will make the fussiest manicurist a happy person and it is pleasing to the eye too. This one is popular with those who have indoor grow rooms, and especially those gardeners that have limited space to work with. 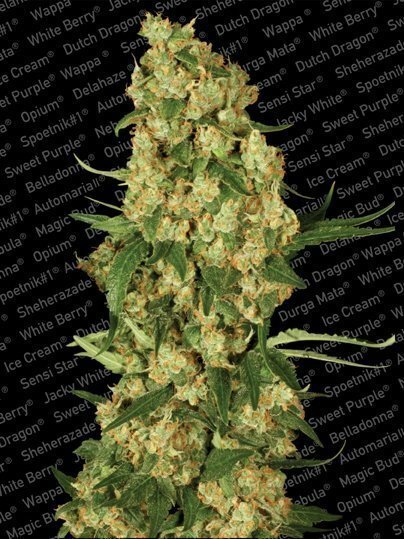 Wappa is a medium sized plant that packs a very big punch, evident in the thick cola and the proliferation of buds that surge from the side branches. As an outdoor plant, Wappa proves its qualities equally. It will perform in a more moderate climate, and grows well in the UK, Holland, Austria and Poland and parts of Canada. This plant will deliver the northern cultivator enough nuggets to store way for the long winter months ahead. However, Southern region growers in Europe, the USA and the countries of South America will best benefit from Wappa’s outdoor performance. Give this plant sunshine and it will reward you with buds. The buzz is intense, but not overwhelming. It sinks into the body, providing an indica carpet to walk over but never dragging you down. In fact Wappa brings an upful sense of purpose to your day’s proceedings. It has great power, but a benign power that will push you towards the doors of perception with a gentle nudge rather than an elevator free-fall. A good day smoke and one to keep the evening going too. Also popular with medical patients. Yield: 550 g per m² indoors. 700 g per plant outdoors.